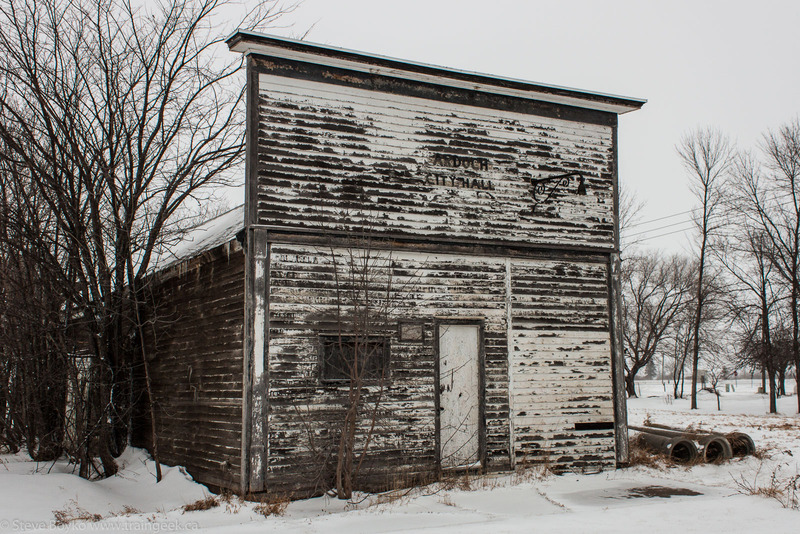 After my little trip to Grafton, North Dakota, I returned to Grand Forks and spent an hour looking around. My first stop was North Washington Street and the industrial locomotives at Gavilon Grain. I photographed these back in April 2011 and I won't repeat the photos here - the Con Agra GP7 and the Peavey SW7 are both still there and look the same. Next I went to the North Dakota Mill, a massive facility. Fortunately I spotted a BNSF locomotive working there. BNSF 2256 was switching on the north end of the facility. I believe this was being operated via remote control by the gentleman pictured above, cleaning out switch points. The wind was blowing pretty hard and there was a lot of blowing snow. I took a little video of the locomotive running light over a crossing. 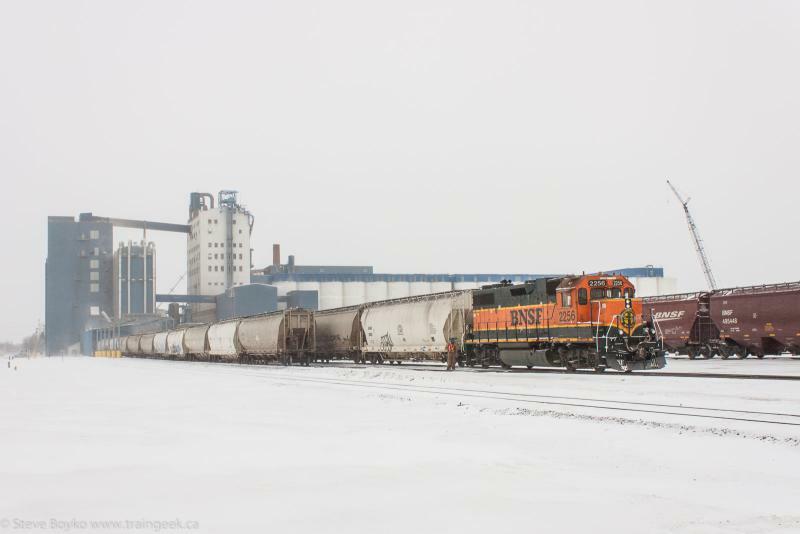 I saw BNSF 2256 in Grand Forks back in 2011. After that, I headed south down Washington to BNSF's yard. BNSF 3004 was working in the yard in the background. BNSF 1546 and BNSF 2834 were parked near the main building. The main excitement for me, though, was a trio of foreign power. SOO! Well, not any more, but clearly it was a SOO engine. Clearly an ex BN unit! Those were fun to see in a BNSF yard. There was one locomotive over by the turntable, BNSF 4606, surrounded by some maintenance-of-way equipment. 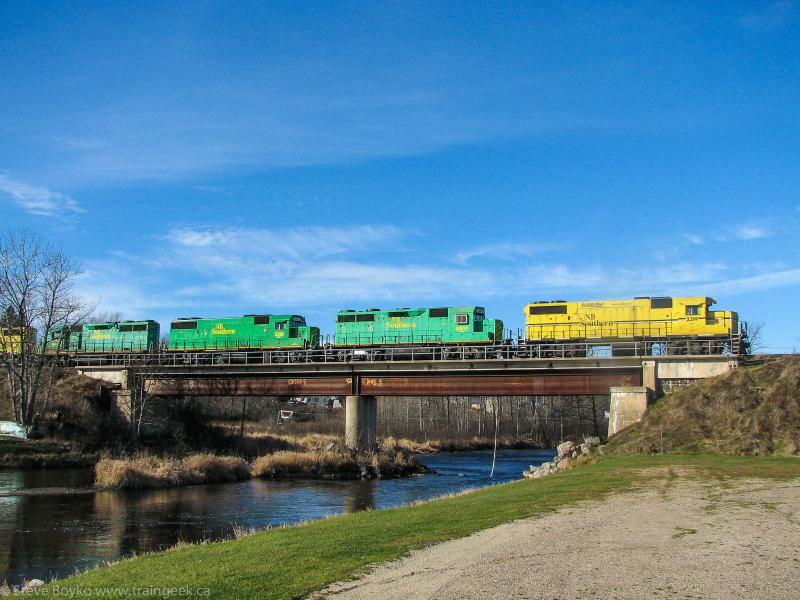 I spotted a pair of Burlington Northern snowplows - BN 972501 and 972510, both of which I spotted back in April 2011. I was almost out of time, so I headed west on Gateway Drive to get back to the interstate. I noticed a train was heading out of the yard so I resolved to grab it before heading back to the hotel. I got ahead of it, and after a bit of driving to find a safe place to park, I ran back to the tracks. 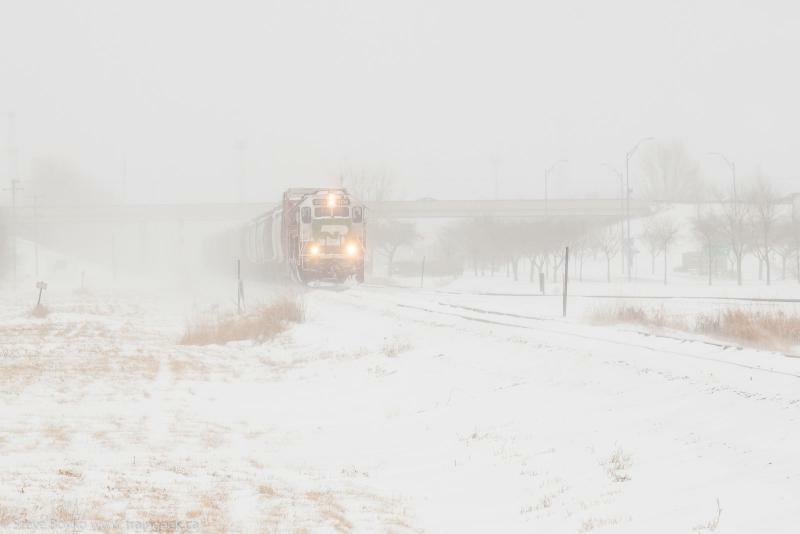 Fortunately the train was heading directly west, rather than going south toward Fargo! I was surprised to see BNSF 3134 and BNSF 2259, the very same locomotives I saw in Drayton on the previous day. The weather wasn't so nice this day! On Monday (Louis Riel Day) we headed back north to the US border. At Drayton I photographed BNSF 4382, BNSF 5679 and BNSF 4438. We crossed the border and I kept an eye out for CN 532/533. 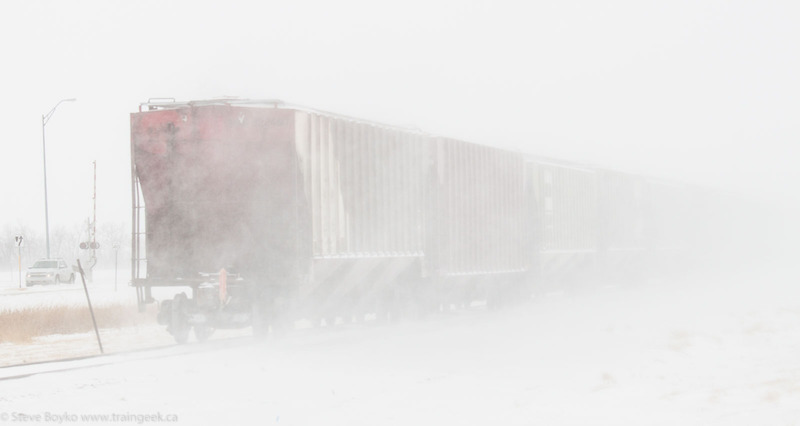 There was nothing at Emerson but as we drove through the blowing snow, I kept looking and eventually I spotted a train just south of Morris. I pulled over, hoping to get a great action shot in the blowing snow... only to realize they weren't moving. I drove closer and found CN 2640 and CN 2508 with a medium sized train. I don't think there was a crew on board. That was the end of our Grand Forks adventure. Thanks for reading! This past weekend my family went to Grand Forks, North Dakota just to get out of the city for a while. 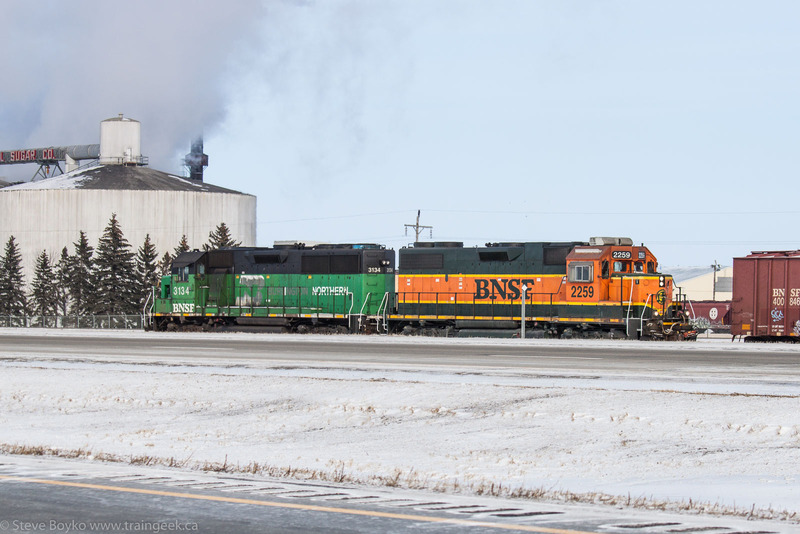 On the way down on Saturday afternoon, I caught BNSF 2259 and BNSF 3134 at the American Crystal Sugar Factory in Drayton. They process sugar beets here, much like Manitoba Sugar used to do in Winnipeg. 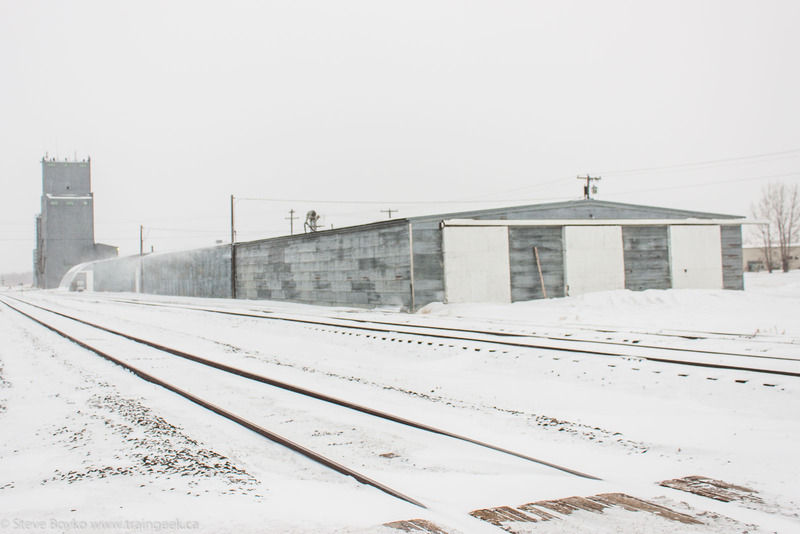 There are always lots of rail cars at the Drayton facility and usually a few BNSF locomotives around. The plant uses a Trackmobile to move their cars. We enjoyed the Holiday Inn Express and visited the many stores of the area. I negotiated a little railfan time for Sunday morning, and after a quick (free) breakfast I headed out before the official sunrise. It was a gray day. 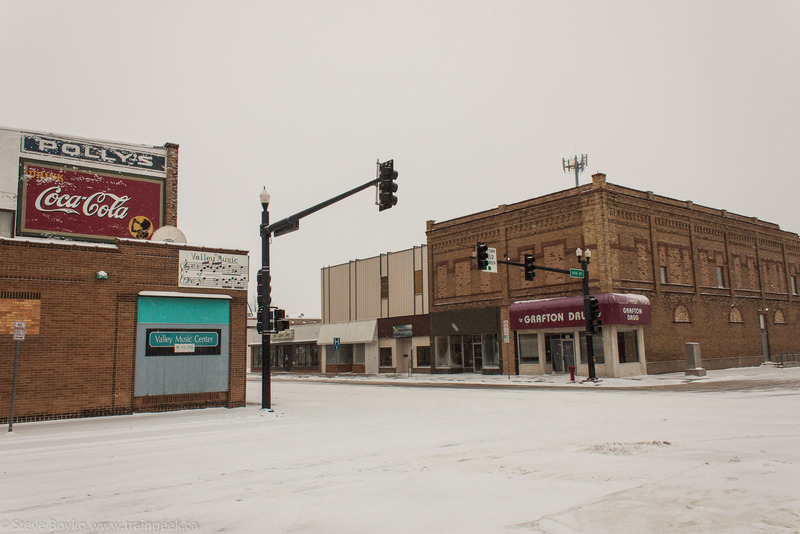 I had thought of heading south toward Fargo to catch some mainline BNSF action, but some railfans had mentioned Grafton as a place to go. 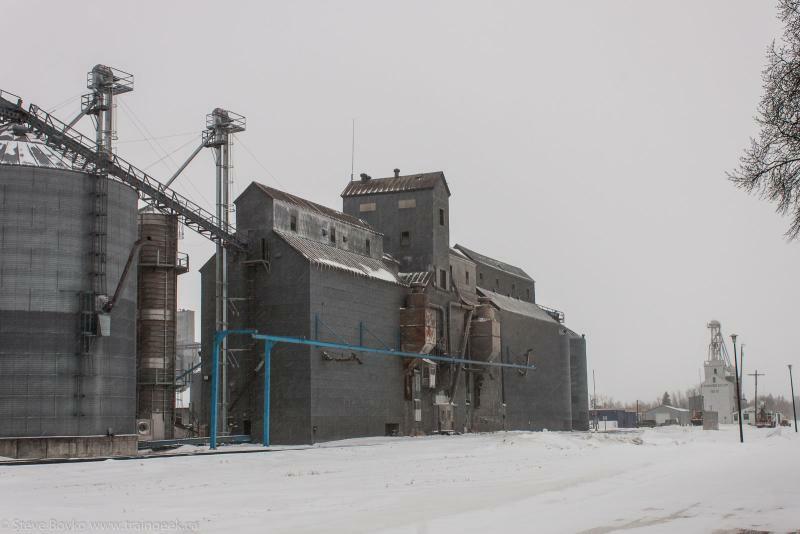 I didn't really know why, other than the several grain elevators in town, but I decided to go see what the fuss was about. 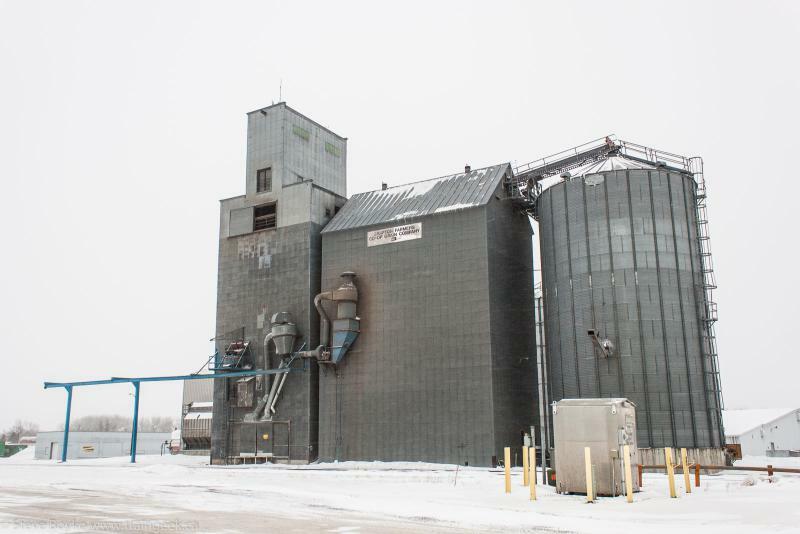 I headed out on the 29 up to Manvel, home of a large grey grain elevator. A gray elevator for a gray day. I drove around the town for a bit and found a few interesting sights. There are two very old outside-braced boxcars in someone's backyard. 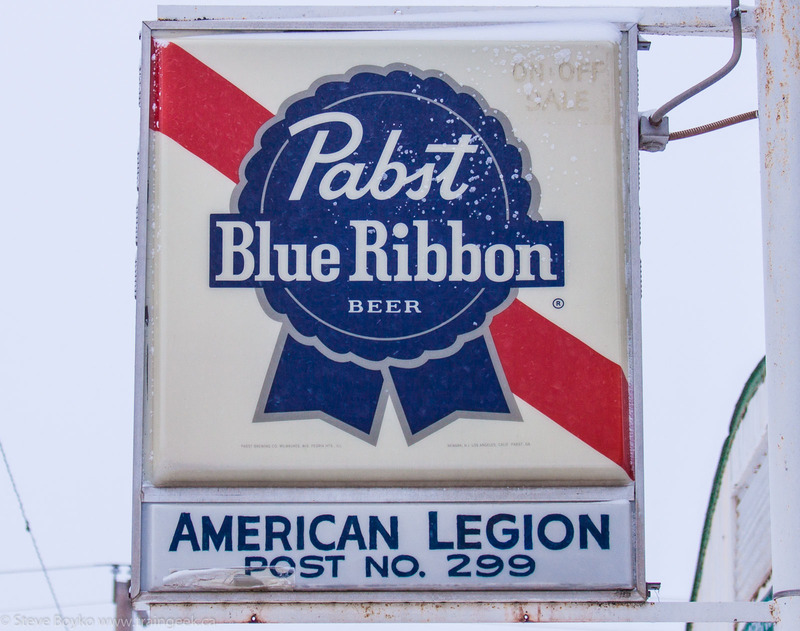 Like many small Canadian towns, the Legion can be counted on for a little entertainment of the liquid kind. This long low building was (is?) the Manvel Bean Company. 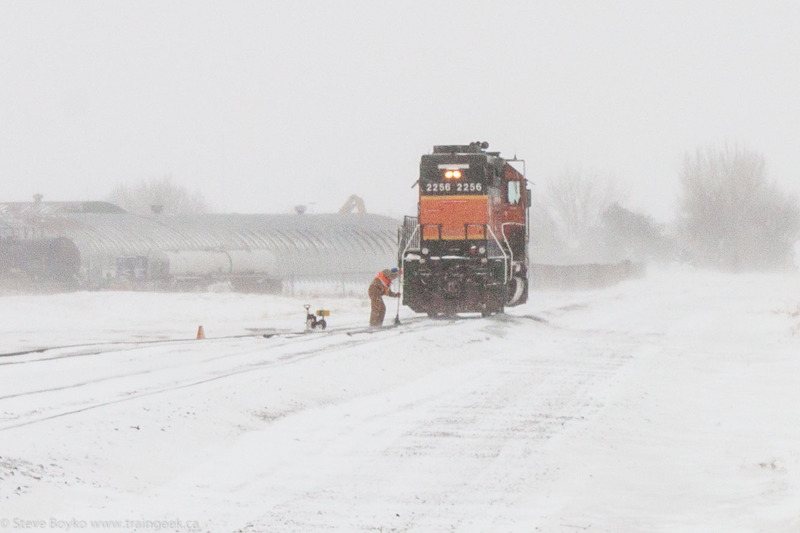 Manvel is mile 12.4 on the BNSF Glasston subdivision, which runs between Grand Forks and just south of Grafton. So that was Manvel. I headed north on the 81 and came across the tiny town of Ardoch. This town features a couple of interesting items. 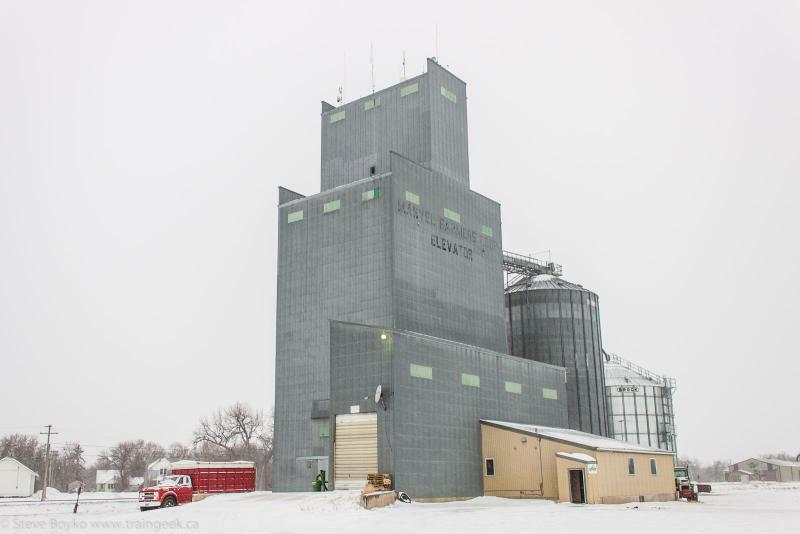 The Northern Plains Railroad crosses BNSF here, there's another sugar beet facility here, but what really attracted me was this wonderful twinned grain elevator. 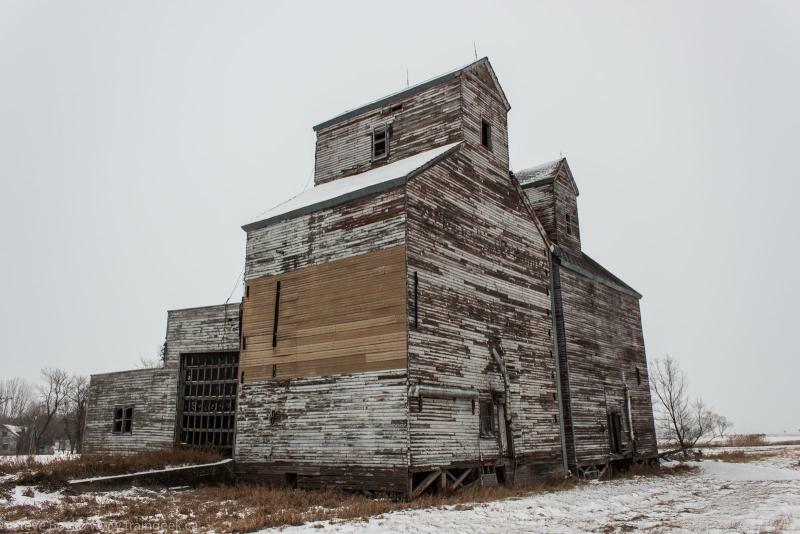 This belonged to the Mondry Grain Company. I haven't found any information on that company. It looks like it was patched at one point. The siding is long gone. I like the garage door covering the driveway. 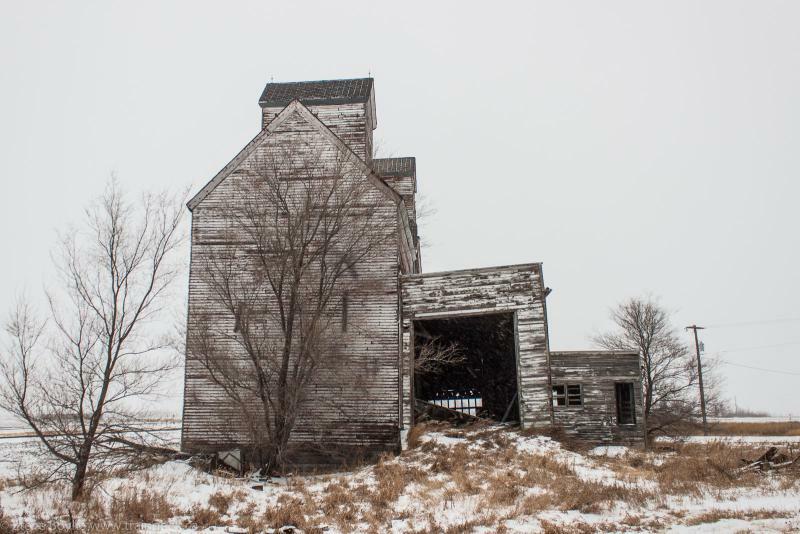 I'd like to come back sometime in better weather to explore this elevator. It was bitterly cold with the wind blowing so I didn't linger very long. I did spot the old city hall. The interchange with the Northern Plains Railroad is apparently a couple of tracks, one of which had some BNSF grain cars and boxcars. It seems it was a GN-SOO diamond "back in the day". The next town north on the 81 is Minto, North Dakota. This is a larger town with a few elevators. I liked the W.L.A. 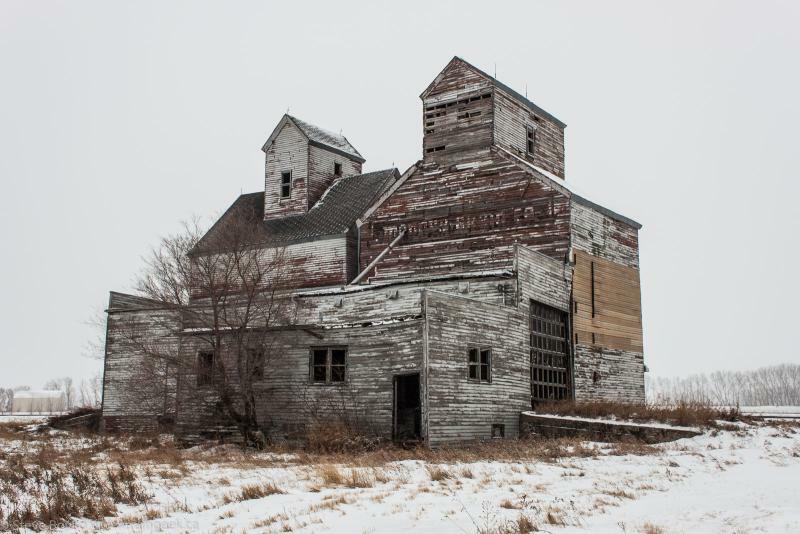 Grain Company elevator. There is a spur to a potato plant but the bridge is quite twisted - I'm guessing from a flood. I carried on north to Grafton. It's the north end of the BNSF Glasston Subdivision and the south end of the BNSF Drayton Subdivision. It also meets the Dakota Northern Railroad here. The DN took over the rest of the Glasston subdivision as well as the Walhalla subdivision. 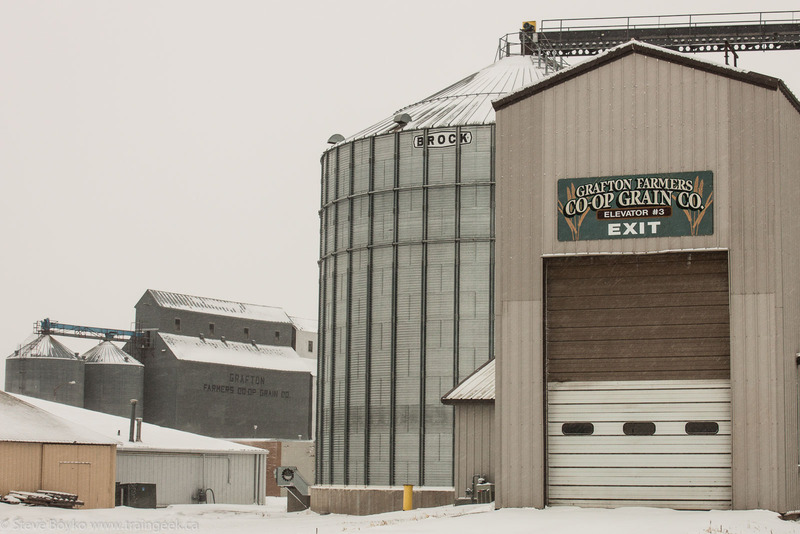 The Dakota Northern's facilities in Grafton are quite modest. I was hoping to see an engine, but nothing was around except this snowplow. 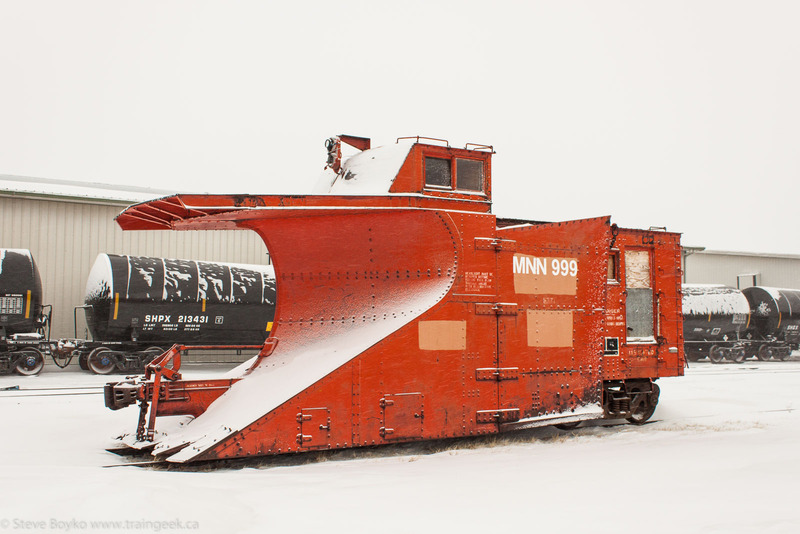 MNN 999 is owned by the Minnesota Northern Railroad, whose co-owners also own the Dakota Northern. 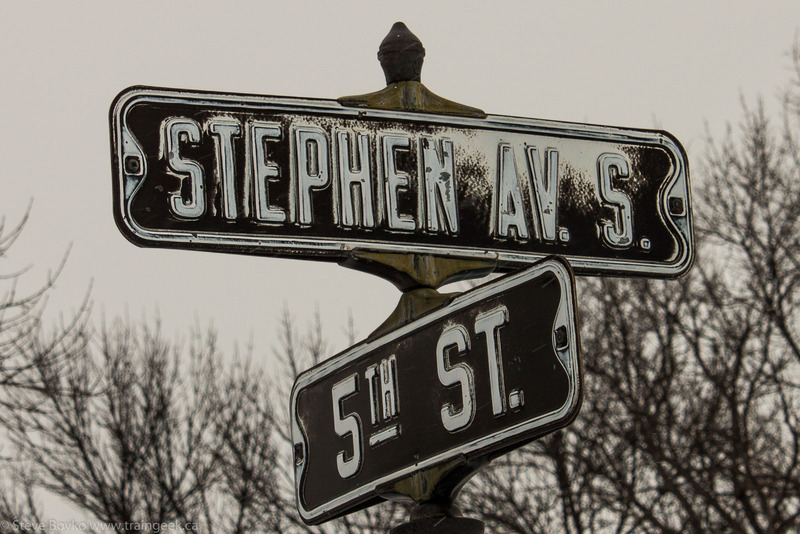 I headed down Stephen Avenue, a very well-named road. 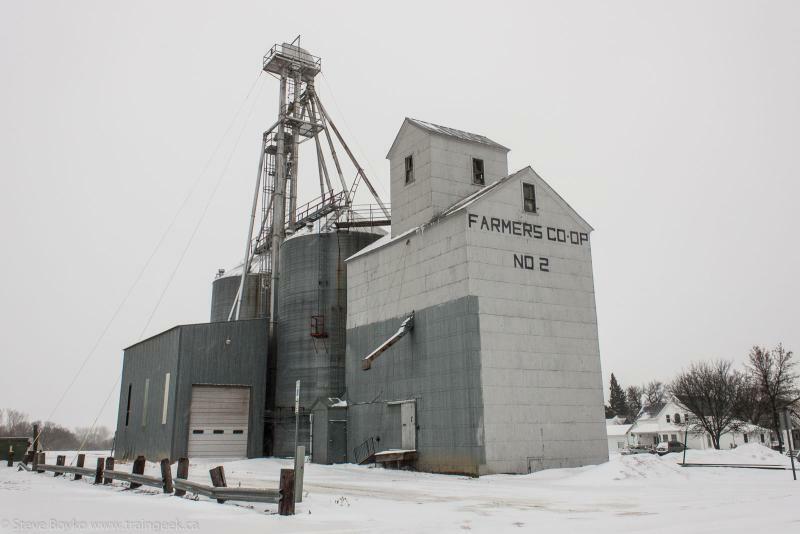 There is a large grain elevator here, I am guessing this is Farmer's Co-Op #1. Note the huge bins and annexes. This elevator has a lot of capacity! 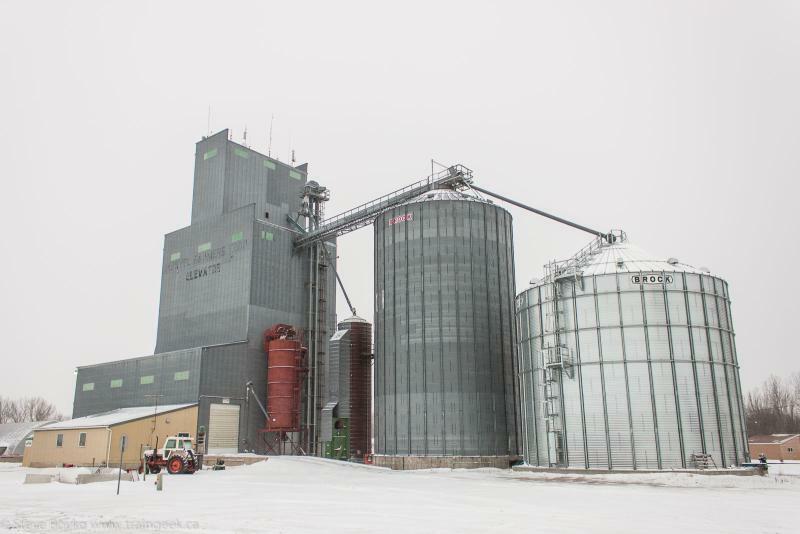 In the distance you can see Farmer's Co-Op #2, a much smaller elevator. On a nearby street is Farmer's Co-Op #3. 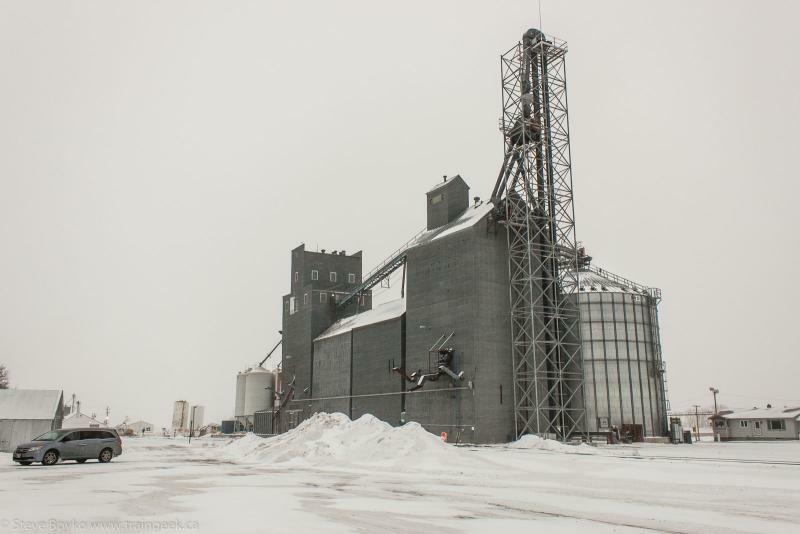 Its shape is reminiscent of the Paterson grain elevators in Manitoba. 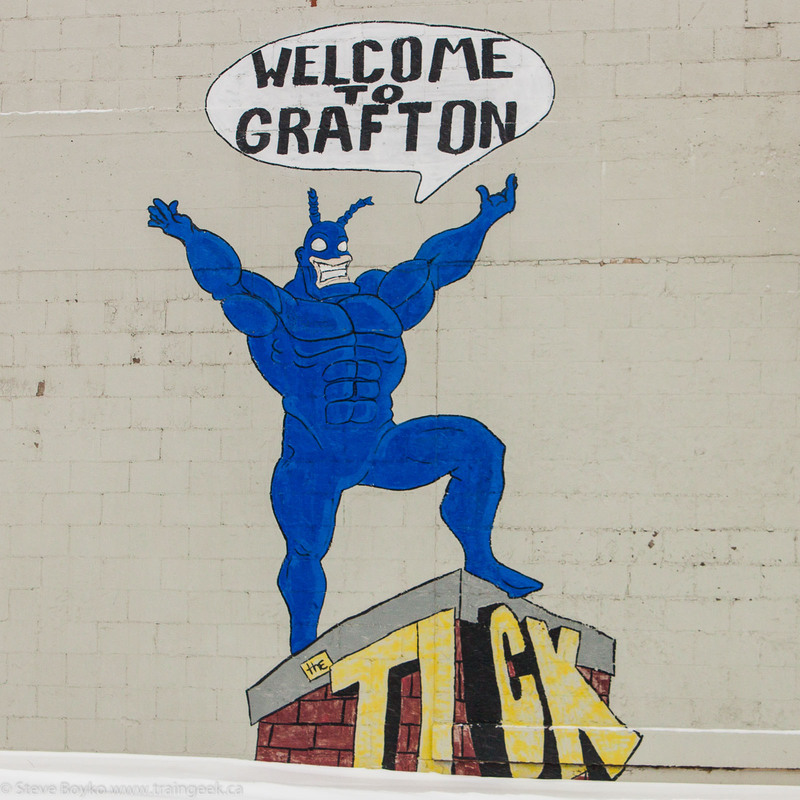 Grafton seems like a really nice small town. BNSF has a little maintenance depot here but not much else. 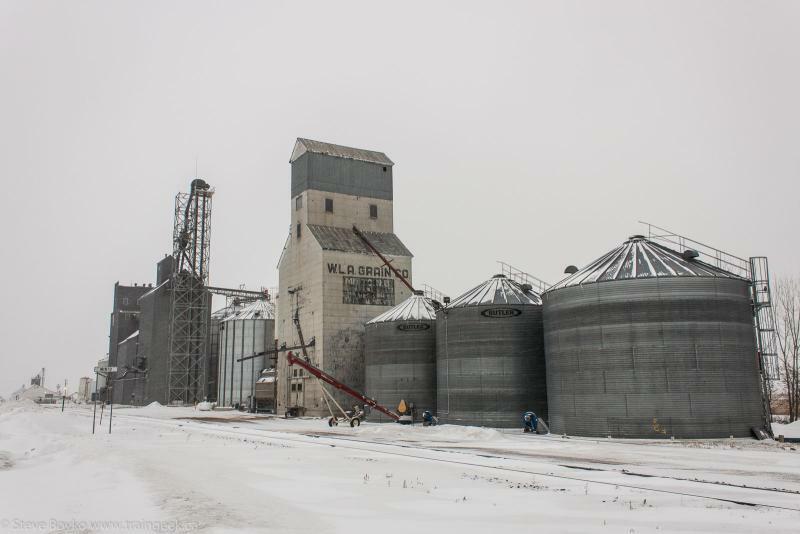 I went north a few miles and found that the remainder of the Glasston subdivison is being used for car storage... tank cars in fact. I didn't have time to go up the Dakota Northern's Walhalla subdivision but I'd like to - there are a number of grain elevators on that line. I headed back to Grand Forks to check out the BNSF action at the yard... more to come in another post! 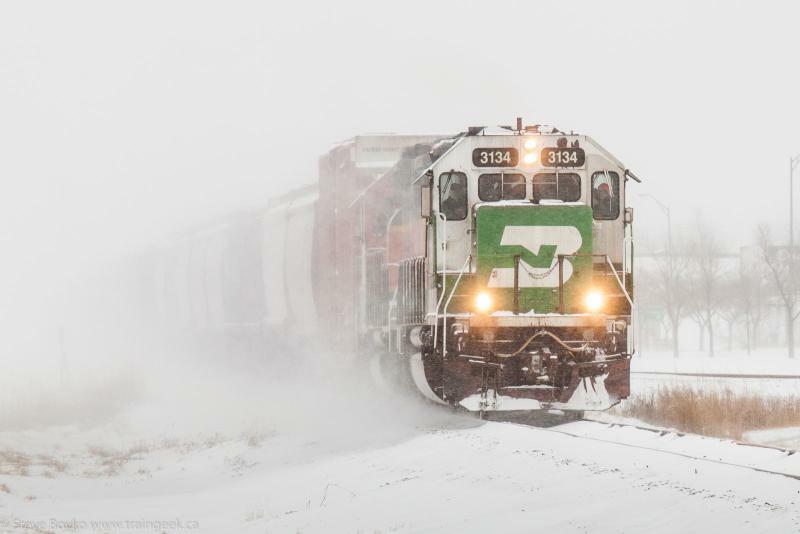 PS if you have a few minutes, why not check out some great railfan blogs like The Beachburg Sub, Trackside Treasure, the CP Rail Manitoba and Minnesota Subdivision, Prince Street Terminal, and Rolly Martin Country? In my last post I mentioned there was a second railway bridge over the St. Croix River between McAdam and Vanceboro. This wooden bridge was a late part of the very first railway in New Brunswick. Back in the early 1800s the town of St. Andrews was a very prosperous town, a serious rival of Saint John in the area. In 1827 a group of entrepreneurs attempted to secure British funding for a railway from St. Andrews to Quebec City, to provide all-year shipping access that was unavailable to Quebec due to the annual freeze of the St. Lawrence River. They were denied funding but St. Andrews did not give up. They had surveys done in 1836 and 1837 and recommended a route that unfortunately went through what could be northern Maine - although the border at that time was not firm. Recall that the Americans and the British clashed in the War of 1812 - the USA was still not trusted. After the Aroostook War and the Webster-Ashburton Treaty of 1842, the planned route definitely went through Maine and was unacceptable. St. Andrews was persistent and in 1847 the St. Andrews-Quebec Railway Company secured a grant of 20,000 acres of land from the province, to go with private British funding, provided the line reached Woodstock, NB. Construction began in 1848, but after numerous difficulties work stopped in 1853 as they ran out of funds. The line had been graded for 25 miles and there were only about five miles of track laid, to Chamcook. The line laid for four years, its "advanced" iron rails rusting away. 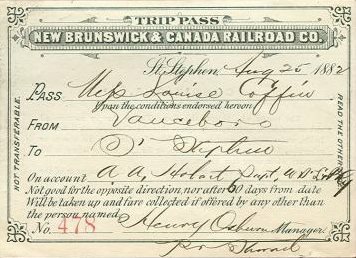 A new company was formed in 1857, the New Brunswick and Canada Railway Company. By October 1, 1857 the first 34 miles were opened to the public. They reached Canterbury in December 1858, and after some delay the railway was opened to Richmond Corner during July 1862. Sadly the company ran out of money and went into receivership in 1863. The line ran from a now secondary port to a field near, but not connected to, the town of Woodstock. 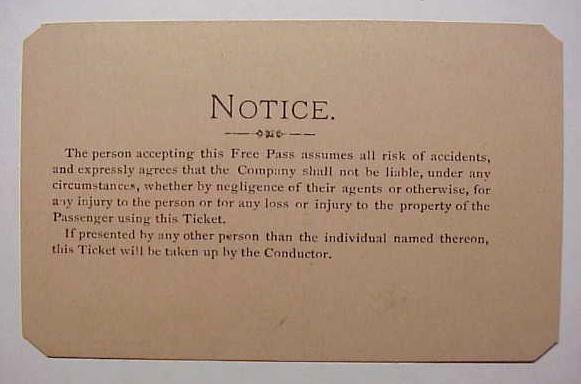 I believe it was extended to Woodstock in 1868 and it eventually crossed the border to Houlton as well, although it never did connect to the Bangor and Aroostook Railway servicing Houlton. 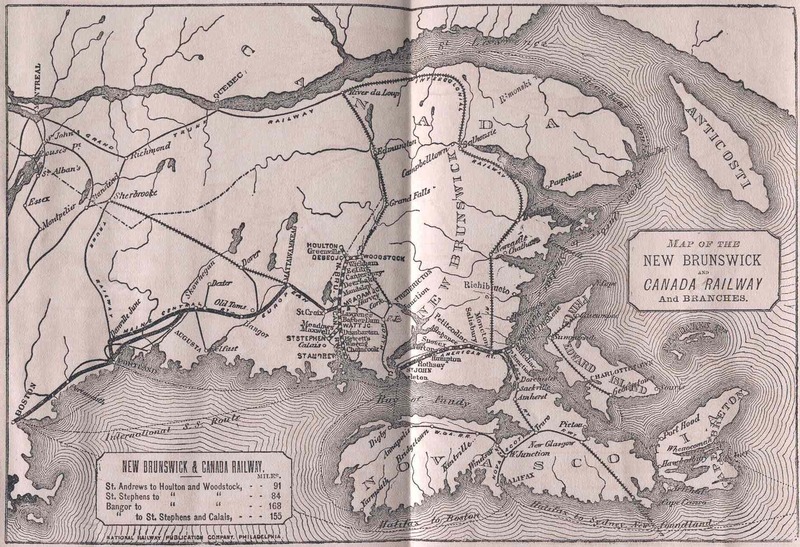 Meanwhile, the European and North American Railway was built between Saint John and Point-du-Chêne, and its Western Extension followed, built between Saint John through City Camp (now known as McAdam) to cross the St. Croix River to connect to Vanceboro, Maine as discussed in my previous post. The line was complete in 1871. Apparently the New Brunswick and Canada wanted a piece of this American action. The following are some news clippings from the period, kindly provided by railway historian Art Clowes. Woodstock, The Carleton Sentinel, Page 2 - Saturday, May 3, 1879 - A branch railroad from the New Brunswick and Canada road at McAdam Junction to Vanceboro is projected. It will be about 6 miles long; the object is to secure billing of freight from Vanceboro to Houlton, Woodstock and the upper country district. There was some skepticism about the need for this railway, given that the Western Extension already ran over the same route. Woodstock, The Carleton Sentinel, Page 2 - Saturday, May 31, 1879 - On Monday last ground was broken on the new piece of railroad between McAdam Junction and Vanceboro, and the work of construction is now being proceeded with. It seems to us that any apparent or real necessity for this branch, in the interests of the public, or of any corporation, must result from a want of foresight or a blunder on the part of somebody. It is certainly not demanded by the pressure of traffic. However a July piece seems a lot more positive. Woodstock, Carleton Sentinel, Page 2 - Saturday, July 5, 1879 - The Branch Railroad between McAdam and Vanceboro is being constructed with considerable rapidity, and will be probably open to traffic early in the coming fall. While, to outsiders, this piece of road looks to be entirely unnecessary, if the parties interested in it and in the now established road would consider their differences reasonably, it may on its completion very greatly effect adversely the business both of the St. John and Maine and European and North American roads, while tending to benefit in the same degree the New Brunswick and Canada road. By the way this New Brunswick and Canada road; which was a long and sort of standing joke, for large feeling railroad men, and which even now is, on account of the utilitarian rather than ornamental character of its equipments, slightly regarded by many, is yearly becoming a more important feature among our railroads; it has developed a very large milling and lumber business along its line; has become the chief artery of trade communication with the up-river Counties on both sides of the line, and is, probably, under its very prudent management, making more money than any other road in the lower Provinces at all events. It may be stated in this connection that the work of relaying the track north from McAdam Junction has been in progress for some days past, and probably the whole 12,000 tons of new steel rails will have been placed before this is published. The new line was built just north of the existing European and North American line. In fact, if you've driven between McAdam and Vanceboro, you're driving on the roadbed at least part of the way. The line was completed on October 9, 1879, with the first train running that same day. Saint John, NB, The Daily Telegraph, Page 3 - Wednesday, October 15, 1879 - HOME AFFAIRS - New Brunswick and Canada Railway - Some months ago the New Brunswick and Canada Railway Company decided to extend a branch from McAdam Junction to Vanceboro and thus connect direct with the trains of the European & North American Railway. The reasons for the building of this extension have been before stated. The work on the road was pushed rapidly, the country was level and favourable to rapid railroading, and a large crew of men were employed. A wooden bridge was erected for the road across the St. Croix River. The laying of the rails was completed on Thursday of last week, and on that day the first train ran over the road, It is now in first-class condition and the trains are running regularly. The New Brunswick and Canada's rails were originally laid on the broad or Provincial Gauge (5'6" between rails) but must have been converted to standard gauge (4' 8.5") prior to 1879, in order to be able to interchange with the Maine railroad. 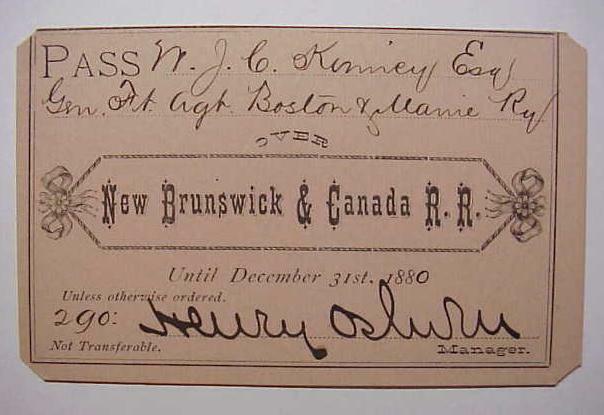 In a final bit of irony for a very troubled railroad, the New Brunswick Railway acquired the New Brunswick and Canada Railway on July 1, 1882 and then acquired the Western Extension in 1883. With both railways under the New Brunswick Railway banner, there was no need for two parallel lines between McAdam and Vanceboro. The 1879 line was abandoned and its route now forms part of highway 4 to the border. 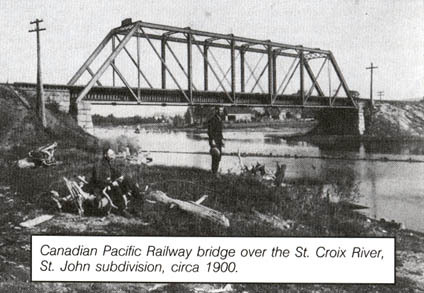 I wasn't able to find any photos of the second bridge over the St. Croix - not surprising given that it only carried railway traffic for a few years - and in fact photos of the New Brunswick and Canada Railroad are pretty scarce. I hope you've enjoyed this little New Brunswick railway history tour. If you have any comments, corrections or additions, please comment! 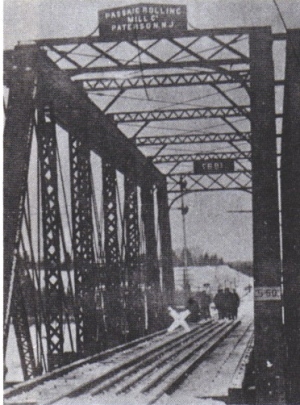 One hundred years ago today, a German saboteur attempted to destroy the St. Croix railway bridge linking Canada and the USA at St. Croix near McAdam, NB. German agent Werner Horn (and an Irish accomplice) planted explosives on the American end of the bridge. The explosives did go off, putting the bridge out of service for a couple of days, but did not cause lasting damage. Horn was quickly arrested and imprisoned in the US (in Atlanta, GA) for a few years before being extradited to Canada, where he was put on trial in Fredericton and imprisoned in Dorchester, NB. In 1921 he was quite sick (suffering from syphilis) and was deported to Germany. The white X on the photo shows where the explosives were placed, and the people in the photo are apparently American customs officers. Remember that in 1915 the US was not in World War I and were officially neutral. Woodstock, The Carleton Sentinel, Page 4 - Friday, February 5, 1915 - GERMAN USED DYNAMITE ON C.P.R. BRIDGE AT ST. CROIX - The steel bridge spanning the St. Croix River on the main line of the C.P.R. was dynamited by a German shortly after one o’clock Tuesday morning. The damage to the structure is not extensive, but traffic was interfered with to some extent. The perpetrator of the outrage was arrested in a hotel in Vanceboro, Maine, and is held there now. This bridge was part of what was originally The European and North American Railway Company For Extension From St. John Westward company, formed on April 13 1864 and mercifully renamed to the Western Extension Railway. The WER was formed to build a line from Saint John to the border with Maine, where it would meet the European and North American Railway [of Maine], coming up from Bangor. The Western Extension was started on the Saint John end in 1867 and the line was built to the St. Croix River (the border) by late 1869. The ENA was started in Bangor on January 1, 1867 but ran a bit late so the two sides were not connected until 1871. American President Ulysses S. Grant drove the last spike in Vanceboro on October 19, 1871. Both the ENA and the Western Extension were originally built to the Provincial Gauge (5'6" between rails) and were not converted to standard gauge (4' 8.5") until 1877. The ENA in Maine became part of the Maine Central, which leased and eventually sold a portion of its track to CP. The Western Extension became part of the New Brunswick Railway, which was leased and later sold to CP and now is part of the New Brunswick Southern Railway. Halifax, Evening Express, Page 2 – Friday, October 2, 1868 – DOMESTIC AND OTHER MATTERS – We understand that an engine used in the construction of the Railway Bridge over the St. Croix River, exploded this morning, killing the Engineer and badly injuring three men. The iron bridge that this post was erected in 1887, according to this news clipping. Woodstock, The Sentinel, Page 2 – April 2, 1887 – NEW BRIDGE – A new iron bridge is being erected by the New Brunswick and Maine Central Railways, on the St. Croix River between Vanceboro, Maine, and St. Croix, New Brunswick. It takes the place of the old wooden structure, and rests on granite piers. The road bed has been raised three feet above its former level. The bridge itself was built by the Passaic Rolling Mill Company (as seen in the top photo) of Paterson, New Jersey. The iron bridge no longer exists. Between 1972 and 1973 a centre pier for the new bridge was built and the new bridge was constructed beside the old one, and slid into place to replace the old bridge. 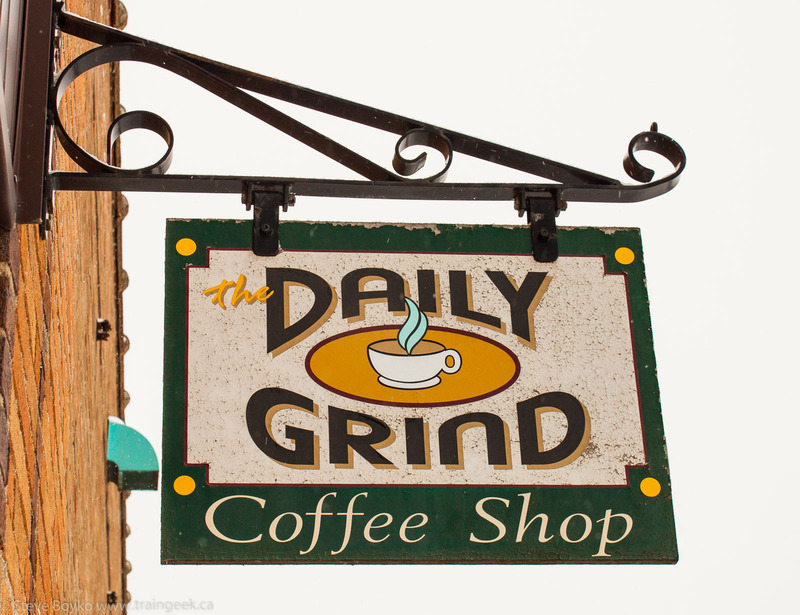 It opened for service on April 25, 1973. 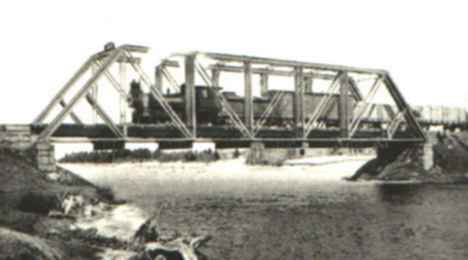 The current bridge is used by the New Brunswick Southern Railway. PS - does anyone know about the other railway bridge that spanned the St. Croix River near this one?